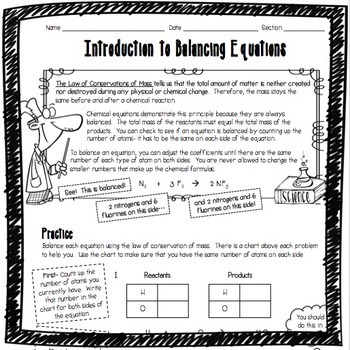 This Introduction to Balancing Chemical Equations worksheet was designed for middle and high school students just learning about balancing chemical equations and the Law of Conservation of Mass. This double-sided worksheet features a helpful overview at the top, which students can refer back to while they’re working if they need help. 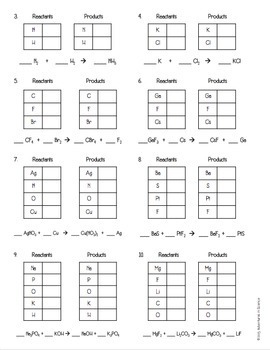 There are 10 chemical equations for students to balance. Each equation comes with a helpful chart so students practice counting up the number of atoms on each side and making sure they match. This worksheet is perfect for a student learning how to balance an equation for the first time! Give as classwork, assign as homework, or leave for a sub! - Name, date, and section at the top. - Margins that have been appropriately adjusted on the front and back pages to accommodate for hole punching and easy placement in a 3-ring binder. - Fun and age-appropriate graphics and fonts for older students! - A complete answer key! * Permission to use for personal use only. * Please do not share this file with others. * Additional licenses may be bought for half price for interested colleagues.